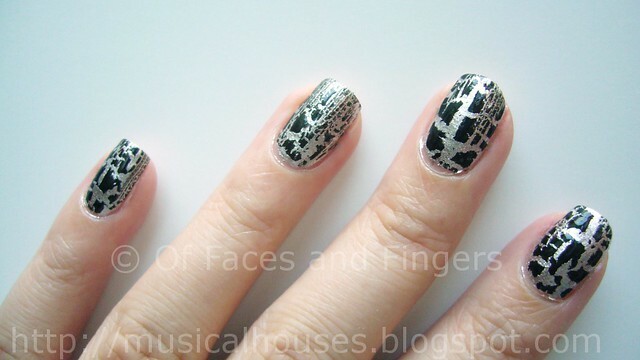 Barry M Instant Nail Effects: Black and Silver Crackle! If you haven't been living on Mars, you'll know what Barry M Instant Nail Effects is - it's this (not-so) newfangled thing called crackle or shatter polish. The reason why these polishes are called crackle or shatters is because, once applied on the nail, they dry up and contract very quickly, producing the coolest shatter/crackle effects ever. Crackle polishes actually first made an appearance in in the late 90's (the brand was Covergirl back then, and the polishes were called Crackle Laquers), but went out of vogue until the trend was revived. Isn't it interesting how fashion - even nail fashion - seems to go in cycles? I mean, there were the Covergirl Crackle Laquers, and then the Sally Hansen Nail Prisms (holographic before holo became a trend), and the Maybelline Street Wears (all kinds of funky finishes and colours back in the day)! So you never know - that old dinky bottle of crap from 10 years ago might just be next trend! Anyway, I'm sure you didn't want to hear a history lesson about nail polish (and yes, I am so much of a geek I know the origins of nail polish trends). I'm sure you wanted to see the awesome crackle/shatter effects. There are many crackle polishes out there, of course, and Barry M and OPI were the first brands to have them out this time round. (Unfortunately Covergirl missed out.) But between the two, I personally prefer the Barry M Instant Nail Effects to OPI's Black Shatter - it's cheaper, and it shatters better. 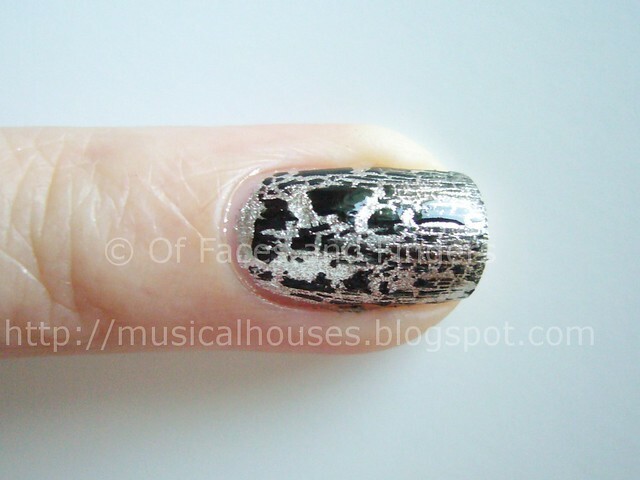 Yes, I said that Barry M's crackle polish beat out OPI Black Shatter! Now I'd better hide before the OPI fans come after me. One of the things to note about applying crackle polishes is that they dry very fast. Very, very fast, as in almost immediately. So they're really like an instant way to glam up your nails! One of the things about applying crackle/shatter polish is that the way the polish shatters/crackles on your nails is highly dependent on how thick or thin the coat of polish is. I've found that in general, thin coats tend to produce finer, smaller shatters, while thick coats tend to shatter in bigger pieces. Whether you prefer your shatters smaller or larger is personal preference, of course, but for me, I strive for a happy medium. Here's Barry M Instant Nail Effects applied thinly. As you can see, it shatters in to tiny pieces, especially nearer the tip of the nail, where the coat of polish was the thinnest. Some people may like that, but for me, it's a bit too thin. And here's the same shatter polish, applied thickly. This one I didn't like at all. It seemed a bit gloopy and clumpy instead of nicely crackling. One of the last questions I faced when applying my shatter polish was - to top coat or not to top coat? Either way is possible, the topcoat just gives a glossier finish to the nails. Personally I prefer applying top coat, because the shattered bits can chip off quite easily without it. I bought this a couple of months ago when it came out, and I used it in the same way. While I got loads of compliments about my nails I felt as if they looked really tatty and dirty, a bit like a football, so I haven't used it since, I might try it again though...! looks stunning with the base paint you used! It's so stunning with silver! I must give this a go. Your nails look lovely. Haha I would happily read about the history of nail polish trends =P it is so funny how things like this come full circle. Maybe 20 years from now MY kids will be begging me to buy them some crackle polish! I prefer the Barry M as well. I even like it applied thickly in your picture. I'm glad someone has finally come out and said it! 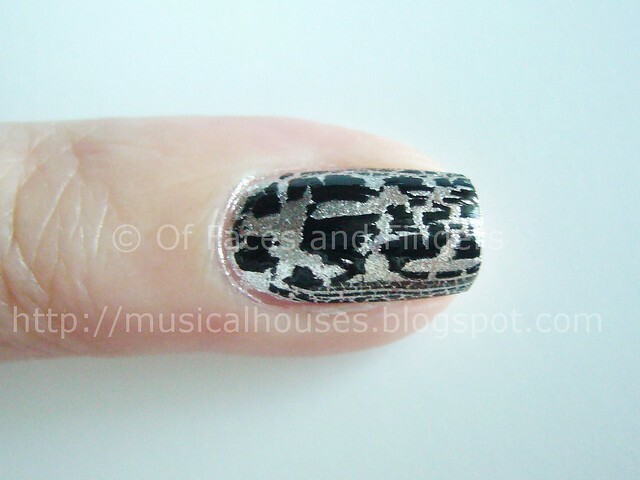 the barry M IS better than the black shatter! and a fraction of the price! Barry M is such an underdog brand in my opinion haha! it looks great over glitter aswell, but i like your silver colour combo too my love! Hi..may i know where did you bought Barry M's nail polish? I'm staying in SG. @Anonymous: You can't get Barry M locally in Singapore, I'm afraid. I got mine by asking a friend who was travelling there to buy for me. Alternatively, you could look on sites like EBay. Some UK brands (like Sleek) ship internationally, so you could check Barry M's website to see if they do the same. Happy hunting! your blog is really lovely! Unique blog on nails decoration. wow very pretty with the silver! and nice blog! LOL on the OPI fan(atics)! Barry M gives a very different 'crackle' appearance. I'm so glad I found your blog! I'm a fellow Singaporean here! Love your posts on makeup for different eyelids (I did a post on that too!) and all about skintones! I was requested to talk about that and I haven't had time to do so... I guess I can just put a link to your blog post! It's great... Followed ya! ahh im so glad you remember those polishes too! i owned them back in the day and kept telling everyone this trend wasnt new.. Bright Summery Teal Eye Look on the Cheap! Liz Earle Mother's Day Gift Set: A Quick Peek! Liz Earle Mother's Day Gift Set Offer!